The medieval Belgian town of Bruges attracts hordes of day-trippers — but don't let that keep you away. While the ultimate sight is the quaint town itself, the city also entertains with an infectious passion for good living. It hides some sweet surprises. 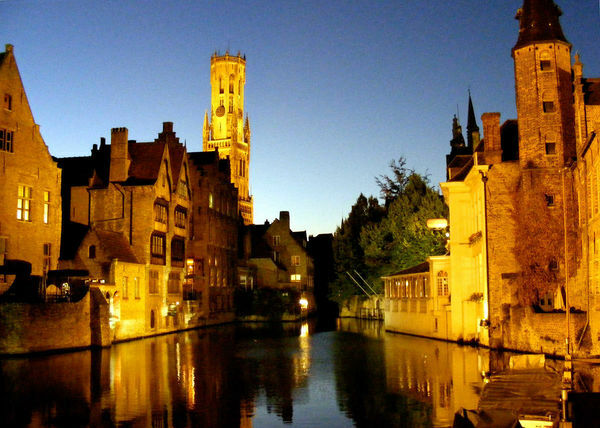 The Flemish who live in this part of Belgium call this city "Brugge," but the French half of the country (and English speakers) call it "Bruges." Either way, the name comes from the Viking word for "wharf." In other words, it's been a trading center for a long time. About a thousand years ago, the city grew wealthy as the most important textile market in northern Europe. Back then, the city's canals provided merchants smooth transportation. But when the harbor silted up in the 16th century, trade moved to the port at Antwerp, ending Bruges's Golden Age. Nowadays, the city prospers because of tourism. Plenty of visitors are attracted by the town's fine pubs — you'll find beer aficionados from around the world bending an elbow here. Belgian beer is barely exported, so enthusiasts must come to it. To gain an appreciation for Belgian beer, stop by the beloved 't Brugs Beertje, a pub famous for stocking more than 300 of the country's brews. If you're not up to sampling every one, go right for the local favorite — Straffe Hendrik — literally "strong Henry." Some beers are brewed only seasonally, so I always ask if there's a special offering. 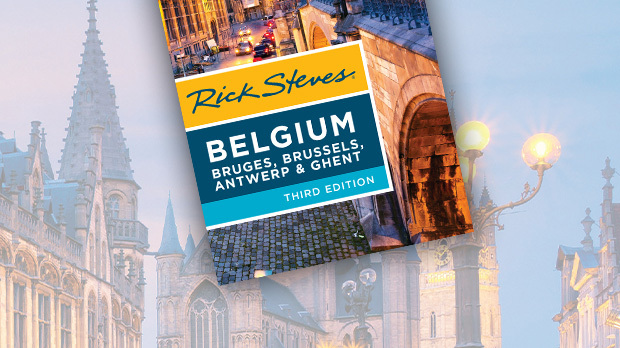 Belgium is the world's number-one exporter of chocolate, and Bruggians are born connoisseurs. Every local has a favorite chocolatier. While Godiva has name recognition, there are plenty of smaller family-run places all over town (one of the best is Dumon; I also enjoy the old-time atmosphere — at cheaper prices — at Confiserie De Clerck). Most are generous with their samples. The people of Bruges buy their chocolate with a concern for freshness like others shop for pastry or bread. Yesterday's chocolate just won't do. Chocolate is sold by weight, usually in 100-gram increments (about 3.5 ounces). It's fun to assemble an assortment of five or six chocolates. 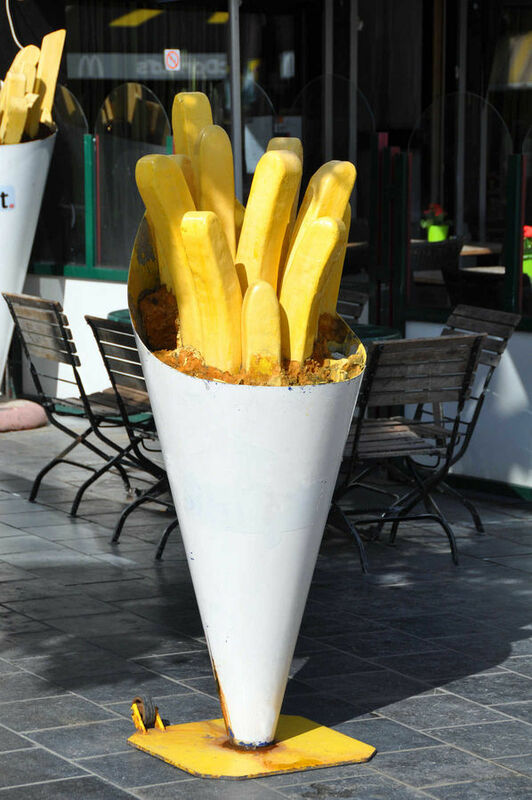 French fries (called Vlaamse frites, or "Flemish fries" — they aren't really French at all) are another Bruges indulgence. One time a local chef took me into the kitchen to witness the double frying — first to cook, then to brown — that makes Belgian fries taste so good. His nervous giggle as he waggled a fry before dunking it in its second hot-oil bath reminded me of the kid who showed me my first dirty magazine. Bruges is the only place I know with a museum devoted to the "French" (Belgian) fry. But skip the museum and instead look for a fry cart (frituur) to sample the real thing. Belgians dip their frites in mayonnaise, but ketchup is on hand for American visitors. When you've had your fill of beer, chocolate, and fries, walk it off with a visit to the Groeninge Museum. This world-class collection focuses on Flemish painting, from Memling to Magritte. You'll gaze at 15th-century canals, into the eyes of reassuring Marys, and at town squares of people littered with leotards and lace. It's an easy introduction to the subtle, technically advanced, and beautiful early Flemish style. At the end of the day, the best place to be is on the Markt (market square), in the cobblestoned old town. Ringed by restaurant terraces, great old gabled buildings, and a bell tower, this square marks the town center, just as it did in its medieval heyday. 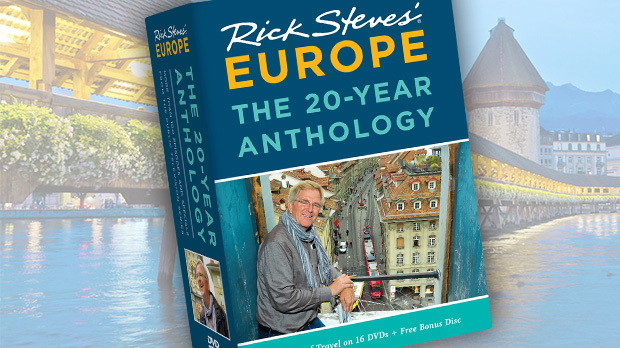 It hosts the best live carillon concert I've found in Europe. Bruges is a city of bells. Though you can hear the tunes ringing out from the tower's bells anywhere in the heart of town, I like to listen from one of the benches in the courtyard below the carillon. Sitting in that courtyard, looking up at the rustic brick tower, and enjoying the music is a ritual for locals and a feel-good pleasure for visitors. Seated there one evening, I gazed up at the lofty tower. Like a kid checking in with a parent before going down a slide at the playground, the carillonneur popped his head out a window and waved. Then he disappeared and began hammering — literally hammering. A carillon keyboard looks like the foot pedals of a big organ, but it is played by the little-finger sides of bare, clenched fists. After the concert, the crowd dissipated. I waited to personally thank the carillonneur. A few minutes later, he was at street level, in his overcoat, looking like any passerby. I shook his hand and found myself gripping a freakishly wide little finger. A lifetime of pounding the carillon had left him with a callus that had more than doubled the width of his pinky. He's just one more artist perfecting his craft in the city of Bruges.